This is a group for anyone who uses Ponyscape to create vectors. If you use Ponyscape to vector, feel free to join! If you used Ponyscape to create a vector, feel free to submit it to the group gallery! Blow up a puppy factory!? Apr 1, 2013 A quick update! Mar 12, 2013 Ponyscape, Inkscape, Collab, and 0.5 Update! Mar 7, 2013 Group Collaberation and Ponyscape 0.5 Update! Mar 2, 2013 Ponyscape v0.4 Patched!! I have decided to let ponyscape.org expire in two days since I am no longer working on it (and haven't been for the past two years. All of the features in Ponyscape have been integrated into Inkscape version 0.92, so you can use that when it is released (or download the beta now). If you would like to hold on to Ponyscape, please download it within the next two days. Additionally, I have moved on to other projects, so there is very little chance of another vector suite being completed or released. That being said, I might work on libraries and frameworks which could be used in a vectoring tool in the future. Lastly, as I have moved on from (and am not really interested in) Ponyscape, I figured I should give this group to someone who is still active within it. If you are interested, please send me a note directly and I will hand the group over to you. I'm doing a stream on Introduction to Vectoring with Ponyscape this afternoon, and decided that since I'm going to be using the latest version of Ponyscape, I would upload it. This is the last version that will be based on Inkscape, all future versions of Ponyscape will be based on a new vector suite that I'm working on. Please note that this version of Ponyscape is unstable, has not been thoroughly tested, and comes with no liability. Please please please save often in order to not lose your vectors in progress. Hopefully I'll have some good news regarding my new vector suite sometime soon! The summer has been very busy for me, so I haven't been able to do that much on it, but things are winding down so I'll be able to get more work done! Thanks again for all the support!! The Ponyscape project is currently on hiatus. Q: Why are you creating a whole new vectoring suite instead of continuing to use Inkscape? What prompted this? A: Don't get me wrong, I absolutely love Inkscape. I think it's a great piece of software and I loved working on it. Unfortunately, a lot of the codebase for Inkscape is messy and combines old coding techniques with new ones, which can get very confusing. It was a constant struggle to try to find the root cause of crashes, and changing some small things could eventually lead to the entire program being locked up or crashing completely. It was very difficult for me to receive bug reports from the Ponyscape users whose root cause was from something very deep in the code (and often not caused by any changes from my development). A couple of things sealed the deal for me when making this decision. The latest beta of Ponyscape began having issues when a dialog was moved, and any attempt to trace the bug was futile. Additionally, while retrofitting the Objects dialog for submitting to upstream Inkscape, the blur slider began to cause random crashes which I was unable to pinpoint. Too much of the Inkscape code would need to change to get it to be clean and modular enough to a point where fixing bugs would be relatively easy. I wish the Inkscape team the best of luck and I know that they will continue to produce a solid vectoring program, but working on the codebase was too frustrating for me. Q: Will this vector suite be free and open source? A: Yes! I plan on releasing this project under either the LGPL, GPL v2, or a dual license as soon as I have something tangible to go off of. Once it is open sourced, if anyone would like to help contribute to it, you would be more than welcome to! I would like to keep the code in a clean, strict format though, so if you would like to join the development team you would need to have a pretty extensive understanding of C++ and code optimization (knowledge of the Qt framework and the SVG standard would help too). I may start a kickstarter for the project once there is enough work put in to demonstrate its feasibility. Q: Why choose the Qt framework over Gtk (or any other)? A: The Qt framework is open source and is focused on cross-platform compatibility. This means that a lot of code that would need to be specially written for Windows, Mac, or Linux can now be written in the same way for all three platforms and the Qt framework takes care of Operating System specifics. This makes the code a lot cleaner and allows the project to focus on new vector functionality instead of fixing compatibility issues. Additionally, the Qt framework is available for a lot of different platforms, including Android. It's possible that a version of this vector suite could be made for Android-based tablets (which would be really cool)! Q: When will this be released? It sounds like it will take a long time. A: Working on a project such as this from scratch has it's benefits in terms of a timeline. The code is very clean and organized so it is easier to expand new functionality. Working in a small development team means potentially being able to rewrite entire parts of the code if need be. Additionally, because the project is aimed at being modular, it's easy to work on individual components without necessarily disrupting others. Lastly, working on a new codebase is a refreshing breath of fresh air, and actually a motivation to continue developing new features. Hopefully I will have something which is somewhat usable within the next couple of months. Q: What about the ponies? A: The vector suite is going to be geared towards professional vectoring, however it will be very modular and brandable. The professional version will be released along with a Pony-branded version which will be the new Ponyscape. So hopefully that gives you a quick update on what I've been doing and the future of Ponyscape. Once I open up the code, any suggestions for new features, user interface designs, etc. will be more than welcome! Please note that development of Ponyscape has stopped! There is a brand new vectoring suite in development, but to do that all work on Ponyscape has ceased. There will be no more bug fixes or updates to this program while the new one is being worked on. This is a group for anyone who uses Ponyscape to create vectors. The development team will be pushing out updates through the group's journal, so be sure to +Watch it if you want to stay up to date! If you use Ponyscape to vector, feel free to join! If you used Ponyscape to create a vector, feel free to submit it to the group gallery! We always recommend that unless we tell you otherwise, it's best to download the most recent Ponyscape version. Ponyscape is a derivative of Inkscape, a free, open source vectoring suite. It is currently being developed by flutterguy317 and is continuously undergoing new feature development and bug fixes. The beta testers listed in the Admins section help review pre-released versions of the software to ensure that the released product is stable enough for use. Unfortunately, our resources are somewhat limited and this software is cutting edge, so we can't catch all of the bugs, so while releases are relatively stable, we recommend that you save your work often. Why a derivative of Inkscape you might ask? Why not just contribute patches to upstream Inkscape? Actually, we do actively contribute patches upstream into Inkscape, and are watching the bug listings to get ideas for new features to add. Unfortunately, Inkscape development is sometimes too slow for our liking, or is concentrated in areas which may appeal to the broader vector art community, but we feel does not provide the most benefit. Additionally, we do not want to limit ourselves too much in the creative aspect, so we feel that creating a derivative of Inkscape that also gives back is an ideal situation. Anyone is welcome to join!! If you do use Ponyscape or are interested in vectoring with Ponyscape, we look forward to having your art featured in our gallery! If you don't currently vector or don't use Ponyscape, we are always happy to have your support! Any submitted art must have been created with Ponyscape. It greatly helps us group administrators if you could note this in your deviation description. Currently, NSFW art is not allowed. Shipping is allowed, but keep it relatively clean. Hay I'm trying to find the one for Mac OC for dask top..if it works for Mac. Do you think you can help? Hey, I've been having trouble with getting the app itself. I tried to download, but all came up was inkscape. It worked for me before in an old computer. Is it possible to download it again? Thank you! Didn't someone make a booru full of MLP screenshots? Does the art submitted still need to be created in ponyscape, or can we submit art created in inkscape as development on ponyscape ended? When is the new release? Is there a specific due date? Ok what is this is brand new vectoring suite in development you talk about? This is a dumb question and forgive me for asking but. So let's say that I want to trace an image of a pony base. Do I trace with the pen tool? I think the link is broken. I tried to download ponyscape but I could access anything. Download link seem to be broken. . . I was trying to download the Windows binary Ponyscape in Windows 10, but I cannot download it because the page or download was not found. Can you help me? If someone was willing to host the ponyscape.org domain would you pass it on to them? Just so that people can still download and use the tool if they want. Also what about just dumping the source code on git hub, so we can fork it and maybe even try developing it ourselves? I have some Ponyscape Non-MLP Vectors to put in this group but they take a long time the approve. My first 9 vectors were made with Inkscape and not Ponyscape. 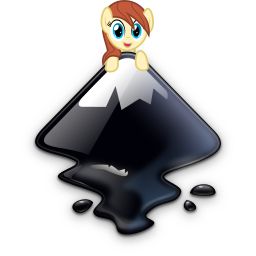 Well my first vector was made with Inkscape but I updated it with Ponyscape. My last 4 vectors were made with Ponyscape. Also I will be updating my first 9 vectors with Ponyscape (Except first one).... Been making Vectors for over 5 months now.